John Sidney played an important role in the nineteenth-century charity scene primarily as a charity secretary but also as a collector, however, little is known about his personal life. He was English and the son of John Sidney, a medical doctor, and his wife Mary nee Johnson. Born in 1846 and living at some stage in Rochester, Kent, he also seems to have been well acquainted with Devon and Cornwall. It is uncertain when he arrived in the colony of NSW, but it was probably sometime in early 1877 and it is possible that he had been a member of the London Stock Exchange; he was certainly quite familiar with London. Prior to his arrival in the colony, John had been married in England to Susan (maiden name unknown) but she either did not come with him to the colony or, if she did, she returned to England from NSW. It is most likely that she never came as no trace of her has been found in NSW or elsewhere in Australia. Early in February 1887, a notice appeared in two Sydney newspapers advising that Susan, aged 35, the wife of J Sidney, had died at her father’s residence in Torquay, Devon. No date of death was given, but less than a month later John Sidney married Margaret Thomson Cameron. At no time, between his arrival and the insertion of the notice of Susan’s death, had John returned to England so it would seem that he and his first wife had been, for whatever reason, estranged. Two male children were born to John and his second wife Margaret, but it seems they died at birth or in infancy as there is no contemporary record of either their births or their deaths. John himself died in 1916 at 70 years of age. At this time he was a recipient of the recently introduced Commonwealth Government pension and was the onsite caretaker of the Royal Society at 5 Elizabeth Street, Sydney. Sidney’s name is first mentioned in charitable circles in 1877 in association with his role as the collector for the Health Society of NSW (HSNSW), an organisation formed in August, 1876. Henry Burton Bradley was the leading advocate of the Society which sought to alert others to various community health issues within Sydney. Initially employed by Bradley as a collector of funds, John Sidney was soon given the task of investigating public baths in Sydney. His comprehensive report pointed to problems of sewage within the Sydney Harbour and for the need to ultimately find another method of disposing of it. In his report he took the initiative to comment upon the supply of meat and on animal welfare at the abattoir prior to slaughter. He found that at the Glebe abattoir on a hot day, the animals were ‘packed as close as sardines’ which he compared unfavourably to the process he saw implemented in London. His association with the HSNSW was short-lived and he seems to have concluded his role as secretary and collector in 1881. 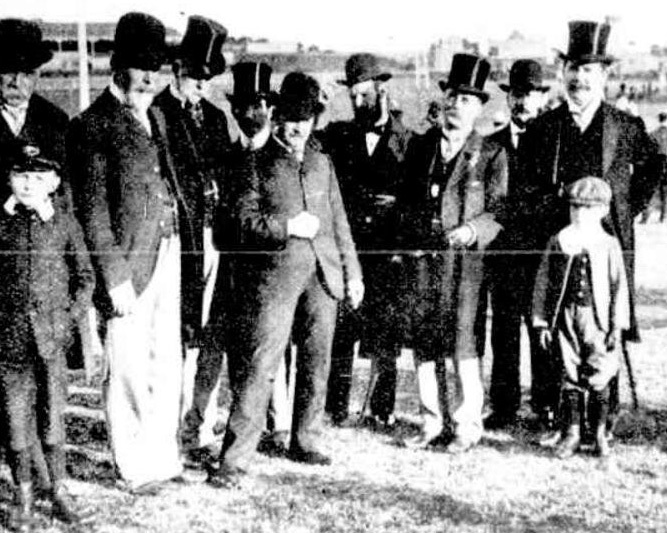 Sidney’s time with the HSNSW, however, began a life-long friendship with Henry Burton Bradley and probably brought him to the attention of the Western Suburbs Horticultural Society of which Bradley was the President. Sidney became secretary for this group in 1878 and retained the position until the end of 1881. His time with the HSNSW also brought him to the attention of those interested in promoting animal welfare in NSW. The NSW Society for the Prevention of Cruelty to Animals (later called the Animal Protection Society) was formed in 1873 and by 1878 Sidney had been appointed acting secretary, becoming secretary in 1880 and holding this position until 1895. During this time he was a strong and vocal advocate for the work of the APS, and a regular letter writer to the newspapers commenting on matters and issues related to animal protection. He was a little surprised at the relative indifference to the prevalence of animal suffering that he found in the colony, saying in one letter to the editor ‘the vagrant starving dogs, broken-kneed horses, and the incessant crack of whips strike painfully upon the softer feelings of those who had lately left the old country.’ Sidney seems to have had a detailed knowledge of some grisly abattoir procedures for the slaughter of animals and communicated these in some detail to the public through his letters to the editor. He was also appointed the Honorary Secretary and the sole male member of the Women’s Branch of the RSPCA (later called Women’s Branch of the Society for the Prevention of Cruelty to Animals, WSPCA) from its formation in 1886 until 1891. The principal employment of Sidney was as Secretary of the Charity Organisation Society (COS) which was formed in NSW 1878. The purpose of the COS was for ‘the prevention of indiscriminate and wasteful charity, to give assistance to the really deserving poor, and to protect the charitably disposed from imposition.’ It was proposed to employ an officer who would attend an office supplied by the Society where persons applying for relief would be sent by subscribers. The officer would make inquiry into their circumstances and, in cases of emergency, would give immediate aid or otherwise report his findings to a committee who would decide the case. This method, it was thought, would help those who really needed assistance whereas the underserving would be sent away. Edmund Fosbery, secretary and superintendent of police, who was also involved with the Society for the Prevention of Cruelty to Animals (SPCA) of which Sidney was the secretary, suggested Inspector Dempsey of the SPCA would be a suitable officer for the new organisation. It is unknown if Dempsey was ever employed by the COS, but it is likely that Fosbery suggested Sidney for the role because in 1880 Sidney became the COS almoner, was its acting secretary by 1882, and by 1883 was its secretary. He held this position until 1910. During the last two weeks there had been 87 applicants for relief against 60 in the previous fortnight. This increase is owing to the number of single men leaving for the country. The 87 applicants comprised 17 married men with children, 9 widows, and 61 single men; 5 of these were refused as being doubtful characters, and three imposters detected, one of whom was sentenced to three month’s imprisonment for being a professional beggar. Beside distributing rations to families, the society has given away 94 meals, and provided 34 beds. In his capacity as Secretary of COS, Sidney often wrote to the newspaper seeking to educate the public on the realities of the needs of those living in Sydney. He sought to direct charitable inclinations in appropriate direction which meant, in the COS way of thinking, towards the deserving poor rather than the undeserving, as ‘an open hand and a warm heart may do more harm than good, unless guarded by careful inquiry, and controlled judgement’. So in one letter he pointed out that while there were waifs and strays that deserved some attention, he knew of cases that were ‘daily brought under the notice of the society where families are actually starving, especially those belonging to the educated classes who through misfortune are compelled to seek assistance’. novices at this work not to place too much reliance upon what they see, but to be guided by what they hear in making inquiry. There are some homes kept in a state of destitution purposely to excite sympathy, and thus, if you supply them with all they want, would be just in the same position next week through pawning or selling what you had so kindly given. From 1877 until 1881, Sidney was also a collector for the Model Lodging House Company of Sydney (Limited) (MLHC) and again his involvement in this work was in connection with Burton Bradley who was honorary secretary of the company. There was already a MLHC in Melbourne, commenced in 1871, to provide housing for working class males, but it proved more difficult to commence one in Sydney. First efforts were made in 1874 by Alfred Stephen but were unsuccessful. Bradley again raised the matter in 1876 under the banner of The Health Society and in August of 1877, The Health Society agreed to attempt to float a company in order to raise the capital to build a lodging house to accommodate 100 men. The company was formed with a capital of £5000, 1000 shares of £5 each, its directors being Thomas Buckland, James Reading Fairfax, Alexander Stuart with Josiah Mullens the broker, and Henry Burton Bradley the secretary. In 1881, Sidney was authorised by the board of directors to collect outstanding ‘Calls’ of £2 and 5 shillings on each share of the company and he was on a commission of 2.5%, being paid £125 in that year. The Model Lodging House was opened on June 19, 1882, by which time Sidney had ceased his employment with the Society. Though no longer employed in this venture, Sidney continued his interest in the subject of accommodation for the poor. He took up the cause of ‘aged persons who had seen better days’ by writing to the editor of the SMH, suggesting that an appropriate way of commemorating the jubilee of the colony would be the establishment of such a home. For he said he knew of ‘many aged people who are eking out a miserable existence, pensioned by a few benevolent friends, who are fit objects for such charity.’ Later he was supportive of the value of the recently introduced ‘Old age pension’ pointing out that ‘many an aged couple are enabled to live together, otherwise they would be parted, the man to Liverpool and the wife to Newington. One of the unemployment schemes run in the 1890s was that initiated by the Rev J D Langley who established the Sydney Church Labour Home (SLH) at Harris Street Ultimo, in 1891; a place where men who were willing to work for their food and shelter were admitted temporarily until they could find work. John Sidney was a member of the management committee from its opening until its closure in 1905 under the new name of the Church Industrial Home. It soon became clear that finding work for the residents was very difficult and that a plan was needed to generate such profitable work for them. In February 1892, 100 acres at Rooty Hill was rented and a farm commenced as well as felling timber and preparing the timber for transport to the home where the timber was further reduced in size for sale. Some 30 to 40 men were involved over a two year period but, due to debts incurred through crop failure, the venture was finally closed. A significant development and new approach in the funding of charities in NSW was the use of ‘Art Unions’ which were lotteries. Sidney became involved in a number of these ‘Art Union’ fundraising schemes when he was a committee member of the ‘Citizens and Parliamentary Committee’ in 1892 which conducted an Art Union, and in 1896 in the Charity Fete, Concert and Art Union. He was an honorary treasurer of the Diamond Jubilee Charity Carnival; the Benevolent Society Art Union organised by W Moffit Burne; the Sydney Benevolent Societies Fete, and the Charity Art Union for COS. Such means of fundraising did not receive universal approval and the Sydney City Mission refused £50 of its proceeds as it was principally raised through a form of gambling. Most of the objection to this form of fundraising centred on the amount paid to its promoters, such as A S Gordon, and the low proportion of funds received actually being allocated to the various charities. In defence of these Art Unions Sidney gave an analysis of those who give to charitable causes. He agreed with Professor Anderson Stuart that there were only about 400 who gave regularly to charitable institutions, and that adding to this the number who gave the conventional guinea would not amount to more than 2,000 altogether. Sidney divided those who gave into three classes: the truly benevolent, the pharisaical donor and the faddist. The truly benevolent were in the 400 who gave regularly, the pharisaical donor appeared occasionally, generally with a large sum which would be publically advertised. The faddist was the one whose name appeared only on the two or three societies he was really interested in. It should not however be forgotten, he said, that large sums were privately given to help individual cases and were not revealed in any printed form whatsoever. Subscriber numbers for these three classes were falling and it was getting more and more difficult to obtain funds, and he said that ‘dispensing relief is only kept alive by the auxiliary help of bazaars, balls, concerts, and art unions’. Regarding Art Unions, Sidney said ‘it is the only way of getting money from a class who rarely give without there is a chance of some return’ noting that ‘obtaining money for relieving distress by the old method of gentlemen collectors calling is almost obsolete’. Xmas with all its mirth and gladness is fast approaching, when friends meet friends to share in the festivities, and many a heart is gladdened in the realisation of prosperity. But with the poor, dark indeed is the prospect, therefore in the cause of charity will you allow me to make an earnest appeal to the benevolent to remember the many deserving men and women in the city and suburbs surrounded by misfortune, and whose hearts are crushed by the suffering of their little ones. In their behalf, generous sympathy is asked to enable the committee to meet the many urgent cases praying for relief and to give extra comforts in the homes of the sick and needy. 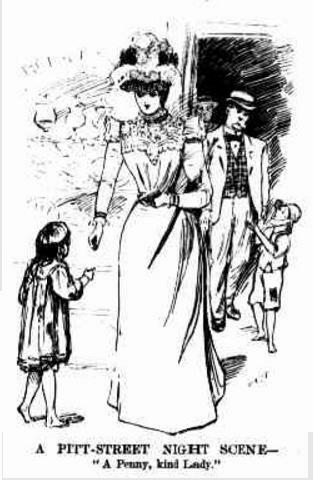 By 1903, charitable giving was very difficult to obtain and this problem was exacerbated by charity subscribers feeling less obligated to give because of the Government opening relief works, assisting the unemployed as well as allocating subsidies to some charitable institutions. The effect of all this, during what were still challenging economic conditions, was that the general public withheld their subscriptions and many charitable organisations were struggling to survive. Sidney observed that the wealthy were increasingly resistant to giving, claiming that they were taxed by the Government and that the working class rarely contributed to those agencies from which they were the greatest recipients. In the face of this Sidney suggested that ‘probably it would be better if the Government took the whole matter over and withheld all grants and subsidies, appoint commissioners, and with the staff of the already large Government Charity Department carry on the work more economically and with better result.’ NSW was moving toward the development of the State as the provider of assistance rather than this being the work of charitable organisations. Sidney took on various roles in addition to those already mentioned, some of which were honorary and some paid positions. He was secretary of the Clarke Memorial Fund, a collector for the Agricultural Society, the Acting Secretary of The City Band, the honorary secretary of the Citizens Committee and an assistant secretary of the National Art Gallery of NSW from 1880 until 1885. He was also a keen letter writer to the Editor of various newspapers. Many letters were on subjects connected with his employment as secretary to various bodies, such as animal protection issues or charity distributions, but many were private issues that John sought to comment upon. Not long after Sidney’s arrival he was unfavourably comparing Hyde Park with that in London, recommending wood block paving, with a description of how it was laid, as used in London where traffic was much heavier than in Sydney. He also made critical comments about various aspects of the passenger service of steamers on route from King Street to Five Dock and a possible Carlingford railway. He also commented on how to solve the Australian variation in gauge between state rails systems, pointing to the English practice of adding an extra rail. He said ‘This plan was adopted on the Great Western line running from Paddington to Plymouth, and Penzance, when it was found desirable to alter the gauge from 6ft to the present one now in use all over England’. He commented on Immigration matters and the unsatisfactory process used by the government to attract immigrants to NSW and seemed to have a good, and it would appear a first-hand, knowledge of the matter. He wrote that the Emigration Depot at Plymouth was an obsolete building on the Barbican overlooking Plymouth Sound and was divided into three departments, for married couples, single men and women. Once inside the walls enclosing this old-fashioned building the emigrants were treated more like prisoners, as they were not allowed out again until the ship sailed. Much later in life Sidney was to become a local agent for the ‘Central Emigration Board, London’ and the ‘East End Emigration Fund, London’ whose aim was to encourage emigration of the unemployed poorer classes to the colony. Late in life, Sidney commented on the need to require husbands to support their deserted wives. He wrote ‘It is to be hoped some concerted action will speedily take place, so as truant husbands can be compelled to contribute towards the support of the deserted wife and family, although they are domiciled in another State’. One wonders, given the strange circumstances of his residence in the colony for ten years prior to the death of his first wife back in England, if he felt any pang of conscience as he wrote these lines. Yet coming to the colony of New South Wales gave Sidney new opportunities and he made the most of them. His work as secretary for various charitable groups and his advocacy through letter writing helped establish their work within colonial society. His time as secretary saw a change in charities being funded from donations by individuals, and harvested by collectors, to the commencement of funding through Art Unions or lotteries. NSWBDM Marriage Certificate John Sidney and Margaret Thomson Cameron, 2197/1887. SMH, May 26, 1887, 8. SMH, June 2, 1879, 5. Strangely there is absolutely no trace of him, his birth or marriage or the death of his wife or any record of his parents in UK records despite extensive searches for information. A possibility arising from a comment in a report he made in Sydney Mail and New South Wales Advertiser, November 17, 1877, 632. His death certificate states he had been in the colony 35 years which would give a date of 1881 which is certainly inaccurate. NSWBDM Death Certificate John Sidney 5175/1916. A Mr Sidney arrived in Melbourne aboard the RMS Tanjore on April 27, 1877, Newcastle Morning Herald and Miners Advocate, April 30, 1877, 2. Though another account gives the name as Gidney; SMH, April 26, 1877, 7 and this seems to be correct. This possibly rests on two advertisements placed in 1877. One by a J Sidney at 179 Kent Street Sydney (Argus August 31, 1877, 8) and another from the same addressing from an ex-member of the London Stock Exchange seeking a position (SMH, August 29, 1877, 10). Shortly after these dates Sidney gained employment with the Health Society of NSW. His familiarity with London is shown in letters to the Editor. SMH, January 14, 1878, 3; February 5, 1878, 3; April 25, 1879, 5. Her family name is unknown. SMH, February 9, 1887, 1. The notice gives no date of death and so it may refer to an event a number of years prior to 1887. It was obviously inserted in view of John Sidney’s remarriage which took place at Burwood on February 28, 1887. NSWBDM Marriage Certificate John Sidney and Margaret Thomson Cameron 2197/1887. Unusually the marriage was carried out by a Registrar and not by a minister of religion. As neither was divorced this would not be the reason for a non-clergyman carrying out the wedding but their place of residence was both listed as Five Dock so it could well be they had been living together and this was sufficient reason in that time for a Registrar to officiate. Sidney’s address had been Fortescue Street, Five Dock from at least 1886-1889. Sands Directory, 1886, 1889. A listing of every meeting reported in the newspapers between 1877 and 1888 where J Sidney was present indicates he did not leave the colony of NSW during that period for any period of time sufficient to travel back to England. NSWBDM Death Certificate John Sidney 5175/1916. The Commonwealth of Australia was formed on January 1, 1901 by federation of the six States under a written constitution which, among other things, authorised the new Commonwealth Parliament to legislate in respect of age and invalid pensions. In the event, the Commonwealth did not exercise this power until June 1908 when legislation providing for the introduction of means-tested ‘flat-rate’ age and invalid pensions was passed. The new pensions, which were financed from general revenue, came into operation in July 1909 and December 1910 respectively, superseding State age pension schemes which had been introduced in New South Wales (1900), Victoria (1900) and Queensland (1908) and an invalid pension scheme introduced in New South Wales (1908). Year Book Australia, 1988. He was appointed by Burton Bradley as collector and the appointment was reported to the Society on October 3, 1877. SMH, October 6, 1877, 2. He was later to become, on Bradley’s death in 1895, executor and a beneficiary in Bradley’s estate. SMH, August 30, 1876, 3. Sydney Mail and New South Wales Advertiser (Sydney, NSW), November 17, 1877, 632. SMH, November 17, 1881, 5. SMH, December 17, 1880, 1. Bradley had resigned the presidency in the previous year and perhaps Sidney’s departure was related. SMH, July 11, 1873, 4; July 15, 1873, 4. In 1895 a dispute arose within the APS involving John Horbury Hunt. At this time the APS was incorporated and Sidney was no longer secretary. SMH, October 7, 1880, 12; May 2, 1895, 2. SMH, March 31, 1881, 8. SMH, September 15, 1882, 7. The Sydney Star (Sydney, NSW), June 1, 1891, 2. SMH, September 10, 1878, 6. Evening News (Sydney, NSW), August 20, 1884, 6 was such an example. SMH, July 17, 1880, 5. SMH, August 4, 1883, 11. SMH, June 24, 1910, 16. SMH, December 7, 1888, 8. Australian Star (Sydney, NSW), December 16, 1892, 2. SMH, June 11, 1892, 7. SMH, June 25, 1892, 11. SMH, June 1, 1878, 11; May 17, 1881, 2. SMH, May 13, 1881. 2. SMH June 20, 1882, 3. SMH, November 5, 1904, 5. SMH, August 7, 1891, 4; Evening News (Sydney, NSW), March 16, 1905, 8. SMH, March 27, 1899, 3. Evening News (Sydney, NSW), November 24, 1903, 4. SMH, November 23, 1903, 5. The Australian Star (Sydney, NSW), November 18, 1892, 2; SMH, June 25, 1892, 10. A significant figure in this development was A. S. Gordon. SMH, September 24, 1896, 4; Evening News (Sydney, NSW), September 7, 1896, 3. Evening News (Sydney, NSW), June 2, 1897, 1. Clarence and Richmond Examiner (Grafton, NSW), December 15, 1900, 1. Newsletter: an Australian Paper for Australian People (Sydney, NSW), April 16, 1904, 15. Sunday Times (Sydney, NSW), June 27, 1909, 1. The Armidale Express and New England General Advertiser (Armidale, NSW), September 25, 1896, 5. SMH, March 25, 1898, 6. Evening News (Sydney, NSW), April 28, 1902, 7. SMH, December 16, 1899, 7. SMH, August 5, 1904, 3. SMH, November 27, 1903, 5. Armidale Express and New England General Advertiser (Armidale, NSW), August 30, 1878, 6. Evening News (Sydney, NSW), April 3, 1878, 3. Evening News (Sydney, NSW), August 22, 1883, 1. SMH, April 23, 1892, 10. NSW Government Blue Book Public Service Lists, 1881, 61; 1885, 78. He commenced December 1, 1880 on £25 and in 1885 received £50pa. SMH, January 14, 1878, 3. SMH, August 25, 1886, 10; August 28, 1886, 9. The letter is under a nom de plume but is later revealed as that of J Sidney, who lived at Five Dock. Cumberland Argus and Fruitgrowers Advocate (Parramatta, NSW), October 8, 1898, 6. He was at the time a resident at Ermington. SMH, April 8, 1914, 13. SMH, June 2, 1879, 5. SMH, March 31, 1883, 5; May 19, 1886, 8. Evening News (Sydney, NSW), July 9, 1909, 3. SMH, June 17, 1910, 8. By phinaucohi in Philanthropy on October 22, 2016 .